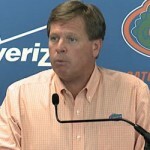 Florida Gators head coach Jim McElwain met with the media on Monday to go over his team’s mistake- and penalty-filled victory over the Kentucky Wildcats on Saturday as well as Florida’s upcoming game against the Tennessee Volunteers on Saturday at 3:30 p.m.
McElwain discussed the Gators’ still-unsettled quarterback situation, struggling offensive line and injuries that could derail Florida as it gears up to face a rival at Ben Hill Griffin Stadium in Gainesville, Florida. But first, injuries: Joining junior linebacker Alex Anzalone (shoulder) on the mend is redshirt junior Jeremi Powell, who is dealing with a “high foot” injury and is “probably out” for Saturday, according to McElwain. Powell got injured at Kentucky, and his loss will affect an already-thin linebacking corps that will now rely on help from the secondary to fill its ranks. Staying with that position group, redshirt sophomore Jordan Sherit (foot) will be fully cleared to go on defense after only playing special teams against UK, and Matt Rolin (undisclosed) will return to practice after being injured with multiple ailments the last few weeks. McElwain still has “no idea” on redshirt freshman tight end C’yontai Lewis (hand), but knows that junior wide receiver Chris Thompson should return this week after a “back kind of issue” (lower back) and redshirt sophomore running back Casey Harrison (thumb) remains out as he’s getting a screw implanted in his hand. McElwain’s primary issue with Grier, whose performance he referred to as “just OK” on Saturday, was that he left some plays on the field by relying on running the ball too often. “He made some big plays with his feet, using his feet as a check down. Sometimes what happens to you is you like, ‘Hey, this is cool, man, I’ll just drop back and look for a hole and run,’” McElwain explained. Though McElwain was pleased with his first touchdown – Grier did not have an open receiver so rolled out on 4th and Goal at the 1-yard line and dove into the corner of the end zone – he was equally as displeased against his end zone interception on 1st and Goal. “He [could have] just given it to a lucky fan [like] it’s arena ball; they could’ve kept the ball. Just give it to a lucky fan. But those are things you learn from and good thing it didn’t come back to bite us,” he said. As for Saturday against the Vols, McElwain said the Gators are “gonna play it the way we play it.” He is pleased with the way Harris handled not playing Saturday, referring to him as a “true team guy” who was “obviously disappointed” but will still prepare and get ready to play against UT. A ways to go: There were plenty of issues facing UF on Saturday, and the offensive line was unsurprisingly one of them. 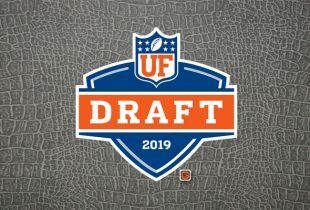 Still the youngest and most inexperienced group on the team, the Gators were unable to hold a pocket for Grier during portions of the game and struggled even more to open up running lanes for running backs junior Kelvin Taylor and freshman Jordan Cronkrite. McElwain is not convinced Florida will be any better against Tennessee, which is obviously a concern, especially because he is aware that UF will be facing much, much more talented players in the upcoming weeks, starting Saturday. “We’re going to start to play some real D-linemen, some glass-eaters and fire-breathers,” he said. Offensive line is far from the Gators’ only issue. Special team has been abhorrent this season with redshirt junior kicker Austin Hardin missing three straight field goals, including one that he actually made Saturday only for Florida to be flagged for delay of game, leading to a miss on the re-do. All of this after McElwain sung Hardin’s praises in the offseason and after Week 1 for his improved leg strength and accuracy. Of course, that was only one penalty in the game. The Gators flagged for 10 in the contest, giving them 22 in the last two weeks after just one in the season opener. This for a Florida team that McElwain referred to as the most-penalized in the nation over the last few seasons and blew up on last week for its poor decision-making in regards to miscues. Considering the NFL extra point is now a 32 yd field goal, a kicker that can’t consistently hit between 30-35 yds has no future at the next level. Let’s see what Jorge Powell can do.